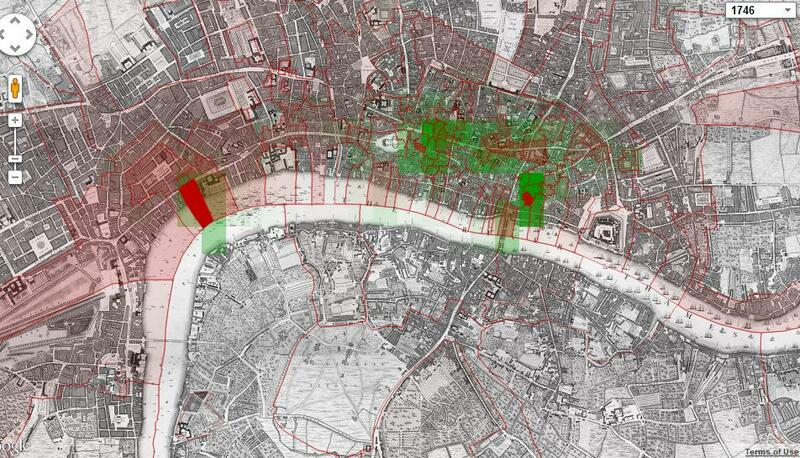 This workshop looked at the Locating London’s Past project (LLP) which launched earlier this week. As a digital project LLP is actually a re-launch, of sorts, of digital projects already available in other forms elsewhere. By making use of various datasets including the Proceedings of the Old Bailey, Hearth tax data, plague deaths records and more, LLP gives the researcher the opportunity to ask new questions from old data. The project is based around an interface that makes use of geo-referencing tools allowing users to map the datasets across London as it appeared in the early modern period (and as it appears today). 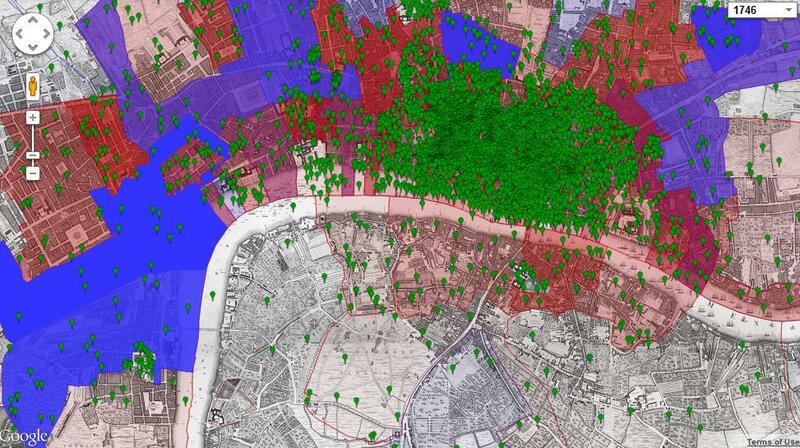 Researchers can therefore locate crimes, wealth, distribution of ale houses, plague deaths, taxes and much more across London and use it as an analysis tool aggregated by parish, population density and various other options. In this first video, Professor Robert Shoemaker walks us through the website and gives various examples of how it can be used and what we might learn from doing so. The video is in part taken from the raw footage recorded from our live stream of the workshop itself back in October alongside images and video borrowed from the website. In addition, the second video offers an account of the roundtable session that ended the day. Unfortunately the video quality is poor but the discussion itself was interesting. So, to the Locating London’s Past website. Is it any good? I decided to look at the extent of fire insurance in any given area. To do this I first selected basic population data and choose to look at it by density in the 1740s (being the closest in time to the fire insurance data which covers the range 1777-1786). I then added fire insurance data (total) to my search and came up with these results. Of course there are strong limitations to this search. For starters the fire insurance data only looks at the Sun and Royal Exchange insurance companies, who primarily operated in the South East and largely monopolised insurance of industrial properties. That explains the strong density in the east end. Afterwards I tried adding data from the Hearth Tax records to see if there was a correlation between wealth (roughly found by higher amounts of hearth tax paid in a parish) and the taking up of fire insurance. From the results it would seem not. Indeed the opposite appears to be the case which would make sense considering that Sun and Royal Exchange largely insured in one particular area and often industrial properties. So what did I learn from this brief exercise? This is a fantastic resource but it is one where you need to think carefully about the data that you are using and combining. Of course, that is true with any data used to come to a conclusion but more so here I think. The mapping of fire insurance against population density and hearth tax confirms not only that the Sun and royal Exchange operated largely in one region of London, but also that it bears little relation to the hearth tax data which covered the 1660s (approximately 100 years earlier). It is probably safer to start by mapping something simpler. 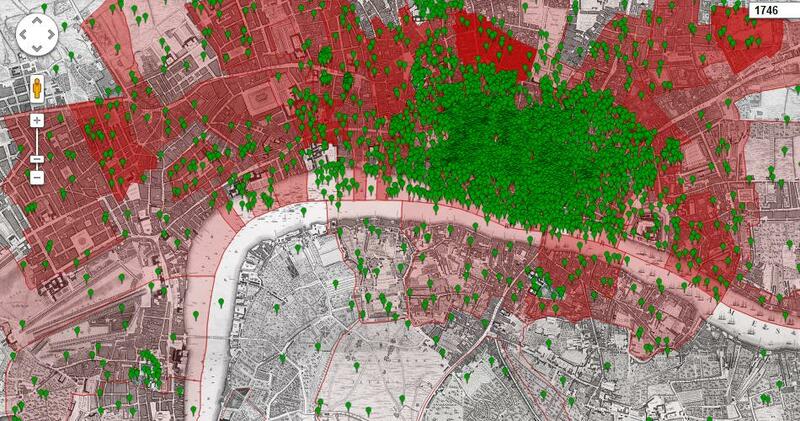 For example various types of crime across London checked against population density, wealth or poor relief. Alternatively start simply by looking at the number of killings by parish (moderated by the 1801 census population data). I tried that and compared that data to female victims with the same selection. It was not that unexpected that most killings of women were in the east end. However, what is interesting is the apparent lack of female killings elsewhere in London (except for a bunch that cross over the Themes between Covent Garden and Lambeth Palace). At the moment I’m still pretty new at trying to work this out and my knowledge of early modern London is perhaps not as good as it should be, but thankfully the people at Sheffield and London have made the website pretty user friendly with a lot of useful information regarding each data set. Nevertheless, to make proper use of the site would require sitting down for a day with a large cafeteria of coffee or pot of tea and carefully working my way through the site and experimenting. Once worked out I think a lot can be gained from this site and some genuinely exciting and useful information discovered. I look forward to seeing what research does appear in the near future as a derivative of work from Locating London’s Lives and, perhaps, at some point I’ll have a spare afternoon to make a proper stab at it myself.